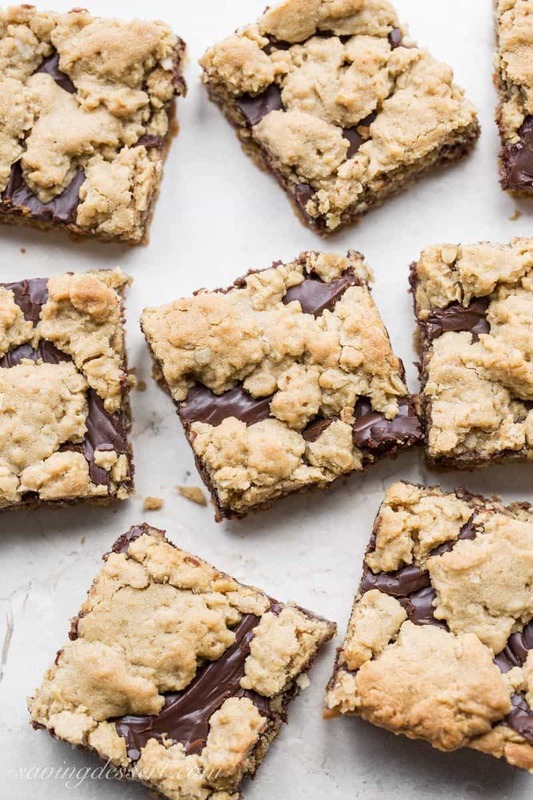 Chocolate Peanut Butter Revel Bars ~ delicious cookie bars loaded with oats and peanut butter mixed together into a tasty crust, layered with silky smooth fudgy chocolate, then topped with more crumbled crust. They are easy to make, travel well and taste delicious! Great for big gatherings, back to school lunches or snacks … or just because. I was so excited … we got invited to a block party! Doesn’t it seem like you can go forever without a single social event and then all of a sudden you’re having breakfast with friends, meetings with caterers, and getting invited to a BBQ? Maybe our neighbors felt like they had to invite us since we live down the street. We’d be able to tell they were having a party in the yard. And I guess it was pretty hard to keep it from us since the couple hosting the party was our son and new daughter-in-law so I guess they had to invite us! Oh the perks of having grown children – we get to play with their friends too! I bet they knew I would bring something homemade to share. 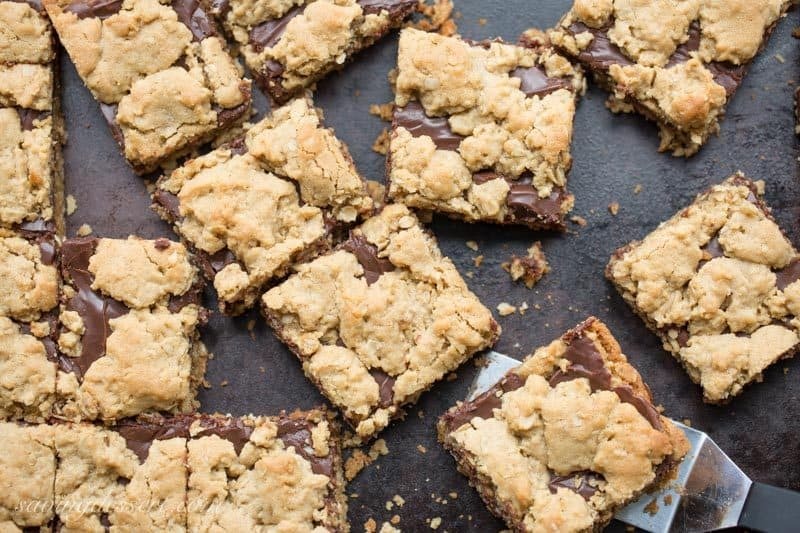 Do you remember Revel Bars from long, long ago? There used to be a box mix available I made several times as a young girl. 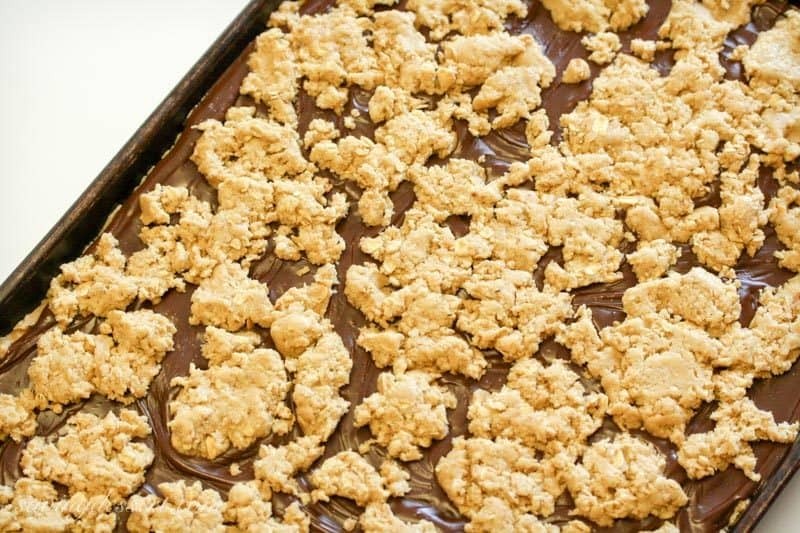 I saw Revel Bars posted on a blog a few years ago and put them on my list of ‘someday’ desserts. These are perfect for a picnic or block party so someday has arrived! 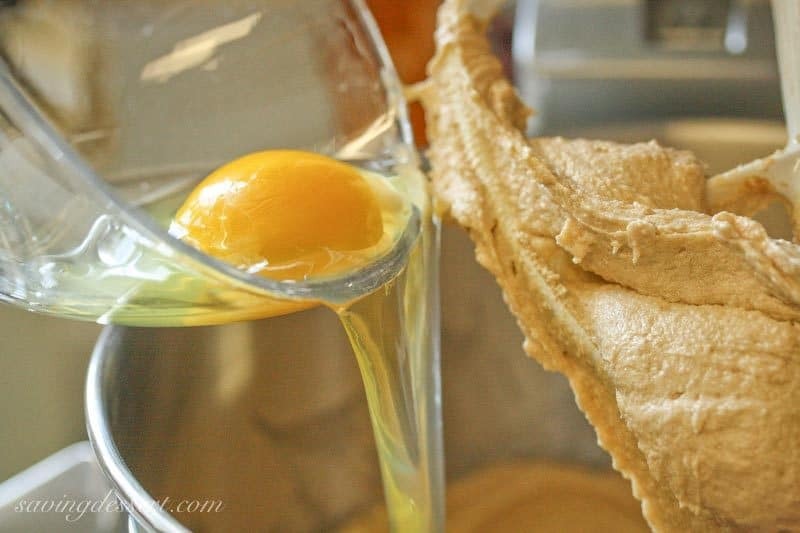 Beating butter, sugar and eggs is always very therapeutic for me anyway. It makes me happy! 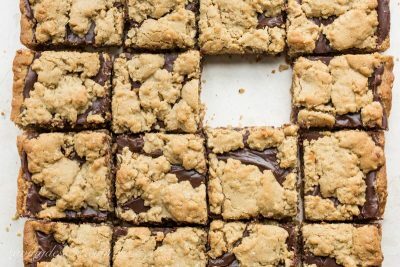 Toss in the dry ingredients and you have a great base for these cookie bars. Yup. 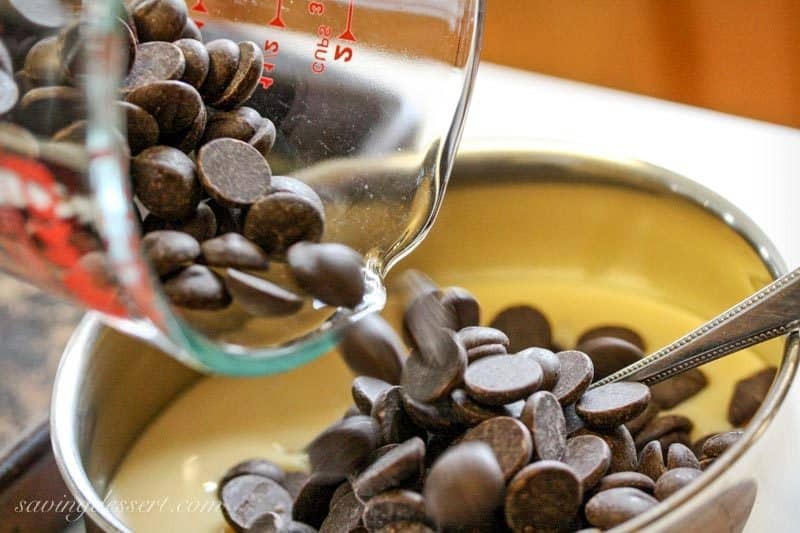 That is sweetened condensed milk and chocolate chips – oh me oh my! Press 3/4 of the oat crumb mixture into the bottom of an ungreased baking sheet. Spread the fudgy chocolate mixture on the base. It will be OK to lick the spoon now. Crumble the remaining oat mixture on top leaving open spaces so the chocolate can peek through. Press lightly to even it up a bit. Bake, cool, cut and enjoy! Revel Bars disappear quickly. I never saw them again once placed on the food table at the block party. They are easy to make, travel well and taste delicious! 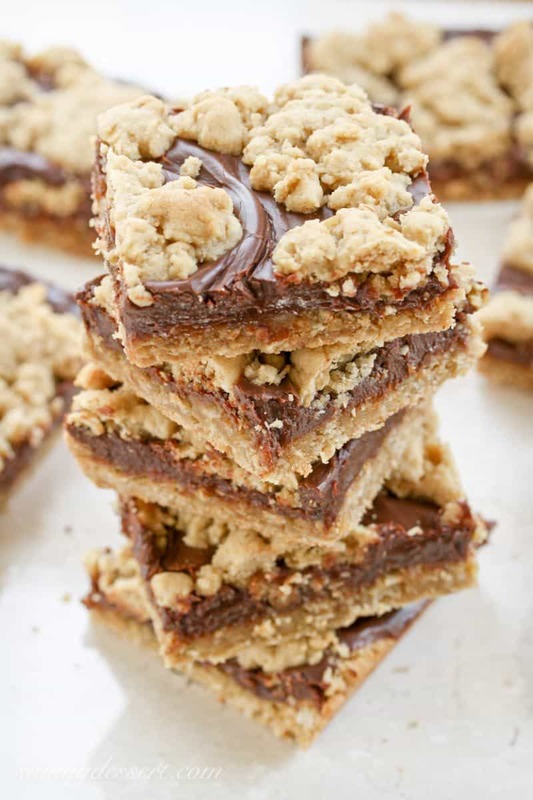 Revel Bars are great for large gatherings and disappear quickly! They are easy to make, travel well and taste delicious! 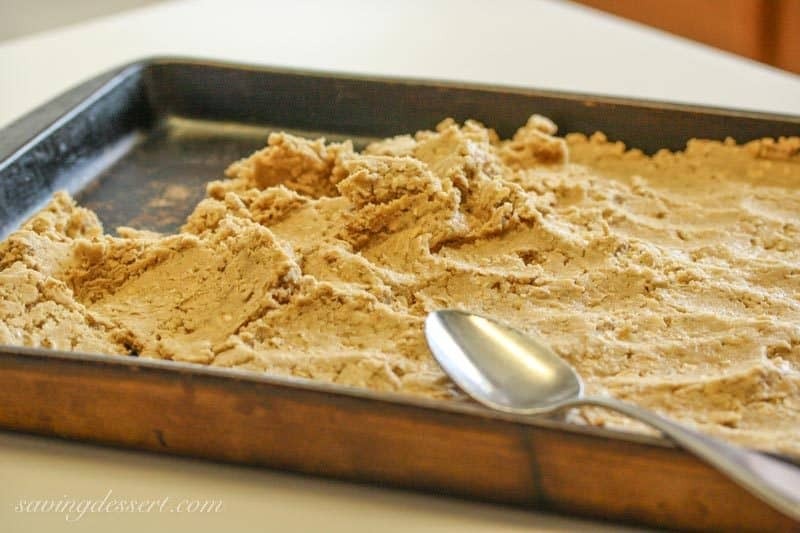 We love a good peanut butter dessert and if you do too, you may want to try these super easy Peanut Butter Blondies and our Peanut Butter Sandwich Cookies too. 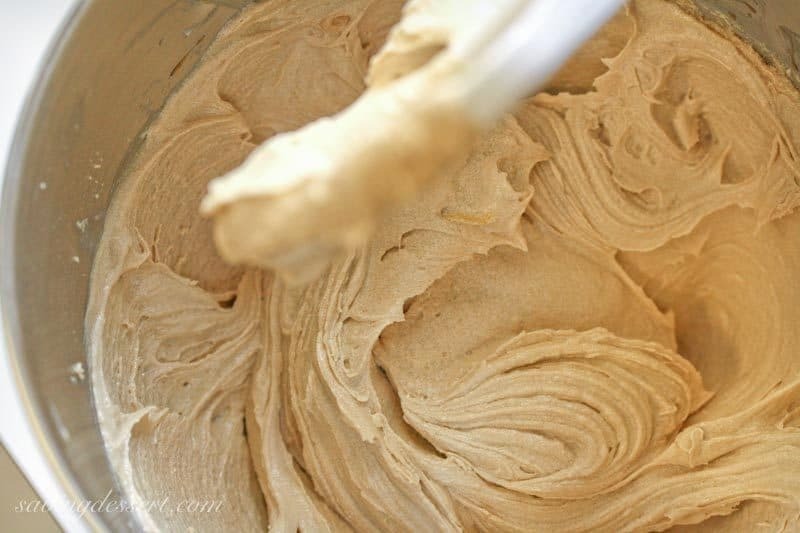 We’re also crazy about this Peanut Butter Fudge Ripple Ice Cream – so delicious! I’m drooling over this Peanut Butter Lasagna from Spend With Pennies, and these super popular Peanut Butter Chocolate Chip Shortbread Cookies from The View from Great Island. 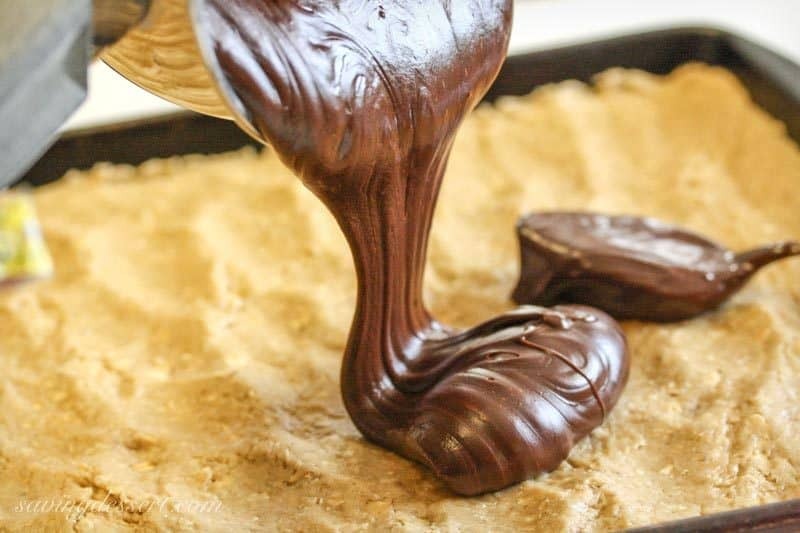 And if you still can’t decide, check out this post with Over 50 Insanely Delicious Chocolate & Peanut Butter Recipes from Love From the Oven! Well I think we’re about ready for our daughter’s wedding. I was invited to attend a meeting with the DJ, and the florist/cake decorator. Everything is confirmed, checks are written and we’re in pre-company mode. Do you have a ‘mode’ for events such as these? I get a game face, or so I’ve been told. I’m on a mission, and all those loose ends must be tied and trimmed, new mulch in the flower beds and the house cleaned. I’m getting pretty excited! I don’t have regular oats. Would it be ok to just use all quick oats? Love to make these and searching for a perfect recipe..and good thing I found your blog. Quick question, why “ungreased” baking dish? Hi Alodia – there is no need to grease the pan. 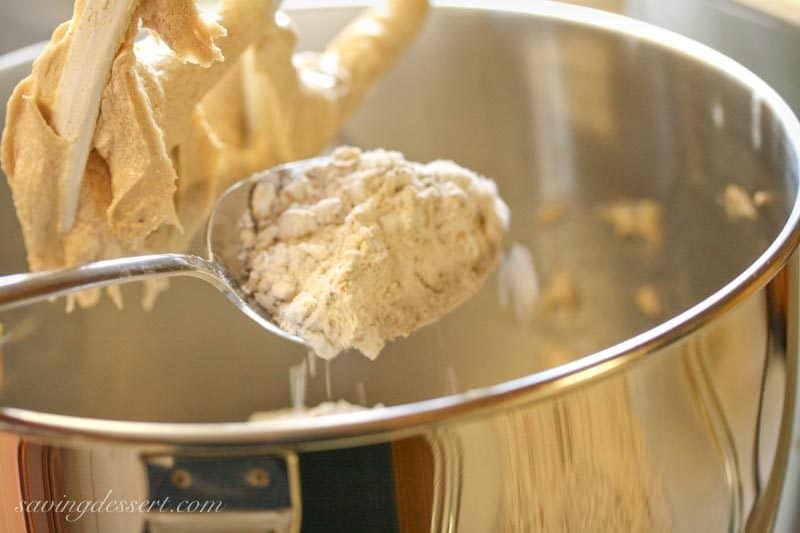 This mixture has enough fat from the peanut butter and butter that there is no need. I think semi-sweet chips would also be great especially if you want the chocolate a little sweeter – enjoy! Is it possible to use something else than condensed milk? (i’m from Israel). Hi Magi – Thanks for the question. There are ways to make your own sweetened condensed milk but since I am not sure what ingredients are available to you, I think it would be best if you searched on the internet for “sweetened condensed milk substitute.” If you have canned milk (evaporated) then you can add a few ingredients and make your own. Sorry I was not more help! 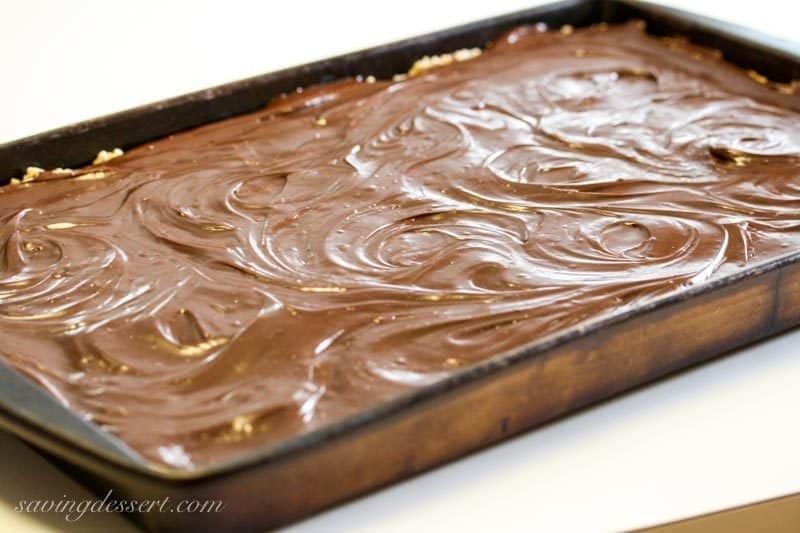 These bars are very tasty and the sweetened condensed milk adds a lot to the texture and flavor. Hope you can find it! Thanks for reading and happy New Year! Why do the directions say to add 3/4 butter when the ingredients list says 1 cup? Is 1 cup correct? Sorry Andrea! I updated the recipe the second time I made it – increasing the butter and peanut butter but forgot to change the directions. Yes the butter should be 1 cup. That was a year ago so I think that's what happened! Anyway – I know you're going to love these – hope the answer came in time. Thanks for reading – enjoy! …mmm those look delicious. I printed your recipe, thank you!! Dance! Go for it! Who's to say no? It's a day of Happiness and dancing makes everyone happy! Congrats and blessings on all of you! Hope you're doing okay Tricia, miss you! These treats look so yummy, a great indulgence! Tricia, if you keep bringing treats like this you will be on everyone's invite list! So yummy! Ooohhhhh these look so, so wonderful! I love chocolate and peanut butter together! These look really good and combine 2 of my favorite foods. I bet they disappear quickly! I'm new here and like your blog! These look SO good! I think that chocolate and peanut butter makes for the BEST combo!! Heck, yes! You need to dance together at the wedding. These bars sound fantastic. I love that your kids live so close to you now! I made these years ago only without the peanut butter. They are sooo good. And how lucky are you to have your daughter live down the street. Ellen DeGeneres says, "It's time to dance." And dance you should. How could you not? Good grief woman. I am a total bar person way more than a cookie guy, although I wont turn one away ;)These look amazing!! Drooling like crazy over the pictures! These look so good! I have no neighbors to share them with, but my co-workers sure would appreciate them! My God, these look unbelievably delicious! I bet they are addictive, Tricia, I meant..what do you expect the combo of peanut butter and chocolate!!! Oh Tricia, these are incredible! I've never heard of them, but they are right up my alley. Congratulations on your daughter's wedding! Tricia, These bars are so amazing that I can have one right now if I could. Hope your block party was a blast!